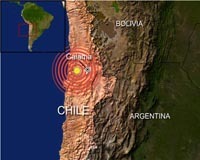 Heavily populated parts of Chile experienced a new 8.8-magnitude earthquake on Saturday, the exact number of new victims is unknown. The nation's hardest-hit major city, Concepcion, declared an overnight curfew. The death count from the earthquake doubled on Sunday from a day earlier, to 708 deaths. Calling Saturday morning's quake an "unthinkable disaster," Chilean President Michelle Bachelet said a state of catastrophe in the hardest-hit regions would continue, allowing for the restoration of order and speedy distribution of aid. The quake struck before dawn Saturday, toppling thousands of houses and dealing a serious blow to one of Latin America's most stable economies. The Chilean Red Cross reported that about 500,000 homes had considerable damage as a result of the quake. Chilean President-elect Sebastian Piñera, scheduled to take office in March, called for more government help in restoring order. "Tonight we will experience a very, very difficult situation with public order, particularly in the area of Concepcion," Piñera told Radio Bio Bio. Concepcion, the capital of the Bio Bio region, didn't have enough police to control all those seeking food and supplies from stores. Some became desperate as supermarkets closed and gasoline was unavailable. On Sunday afternoon, people were seen entering a mill looking for ingredients for bread. In the evening, a CNN team passed a dozen gas stations that were being looted, with people siphoning gas. Military officers were guarding a few gas stations, but few other signs of a government response could be seen. Some small business owners resorted to protecting their shops with rifles and shotguns. Concepcion is under curfew from 9 p.m. Sunday to 6 a.m. Monday because of the looting. The city government is distributing water from the central plaza. Concepcion and its adjacent sister city of Talcahuano, Chile, have a population of 840,000. Video from Concepcion showed collapsed walls of buildings exposing twisted rebar. Whole sides of buildings were sheared off, and at least two structures were on fire. Chile's Office of Emergency Management launched a C130 helicopter Sunday with a contingent of 40 specialized firefighters and 10 search dogs for the rescue effort in Concepcion. People in their homes lacked electricity. Hundreds faced sleeping in tents on Sunday night. More than 90 aftershocks had been recorded, ranging from 4.9 to 6.9 in magnitude. A 6.2-magnitude aftershock was recorded near the earthquake's epicenter on Sunday. Chile has received many offers of international aid and will accept the help that it needs, Bachelet said. The U.S. military and the U.S. Agency for International Development were working to provide satellite phones, the State Department said Sunday. The airline LAN Chile said that three flights left from Peru to Chile on Sunday, one of them landing in Santiago. These flights were not commercial, but were transporting Chileans stranded in Peru back to their country, LAN Chile spokesman Roberto Davila told CNN en Español. Saturday's quake was 700 to 800 times stronger than the 7.0-magnitude quake that struck Haiti in January, which left about 212,000 people dead and more than 1 million homeless. Chile's quake also occurred at a greater depth -- 21.7 miles -- than the 8.1-mile depth of the Haiti quake, which contributed to much of the damage there. Coastal Chile has a history of deadly earthquakes, with 13 temblors of magnitude 7.0 or higher since 1973, the U.S. Geological Survey said. As a result, experts said that newer buildings are constructed to help withstand the shocks.